FLICKA CO-OWNERS, sisters Kristen Sato, left and Lisa Sato. Fans of Flicka will be happy to know that the popular Larchmont Village infant and children’s clothing shop is here to stay. 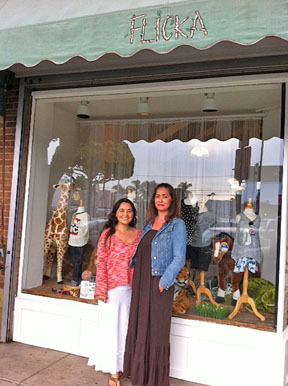 Kristen Sato and Lisa Sato recently took over ownership of the store opened by their mom, Liz Reilly, 21 years ago. According to Kristen, Flicka was inspired by the closing of children’s clothing store Lemonade Lake. “My mom shopped there for our little sister, Caitlin.” When it closed, the Hancock Park resident figured she could fill the void, and opened Flicka in July of 1992. Lisa and her mom ran the store for the first eight years until Lisa left to open a children’s wholesale showroom downtown. Kristen then took over for her. When their mom announced plans to retire, the sisters knew they wanted to hang onto the family store. After securing a lease, they closed Flicka for a week to paint and rearrange the displays, and opened for business with a fresh, new look featuring their personal imprint. What hasn’t changed, said Kristen, is the great selection of children’s clothing, gift wrapping, the welcoming dutch door and a play area to keep little ones occupied while their moms shop. “The response from the neighborhood has been amazing,” she said. “Old, familiar customers have come in to congratulate us, and strangers who heard about the change have thanked us for staying and promised to support us. Flicka, 204 N. Larchmont Blvd., 323-466-5822.